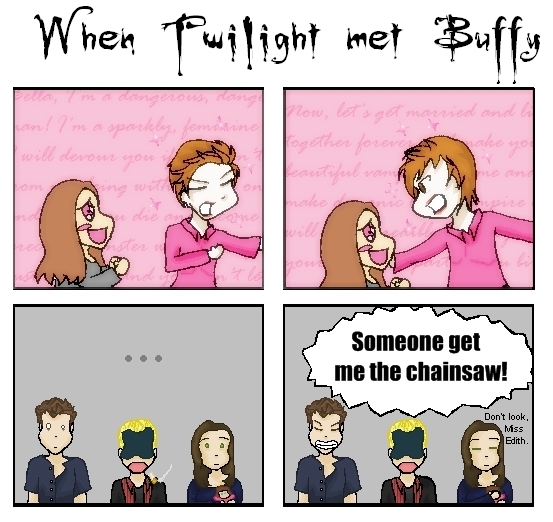 When Twilight Met Buffy. (Because there's never enough Angel, Spike and Drusilla mock Edward fan art.). Wallpaper and background images in the Critical Analysis of Twilight club tagged: twilight buffy the vampire slayer edward cullen angel spike drusilla comic fan art. This Critical Analysis of Twilight fan art contains anime, fumetti, manga, and cartoni animati. There might also be finestra con vetro temperato and finestra di vetro macchiata.